Hopefully if you know me, you’ve heard me say more than once, “There is hope!” or “Our God is a big God and He cares about us, down to the smallest detail of our lives. He still answers prayer.” So why do I still get so blown away when He shows up and shows off?? Had one of my pastors said those words to me, I would’ve believed them. But they know the things I’ve been doing to try to help others so I may have taken it as just words of encouragement based on their knowledge. But this man I’ve never met, who doesn’t know anything about me says: “God said to tell you He’s seen you not grow weary” I was absolutely blown away!! And this my friends, this is why I have the faith I do!! GOD is real! He’s alive. And I’m not sharing this to say anything about me at all. He gets ALL the praise for anything I’ve accomplished. What I’m saying is that God is no respecter of persons and will move in your life the EXACT same way, IF you seek Him! I’m saying that if you’ve been out there working and feel weary, don’t give up! 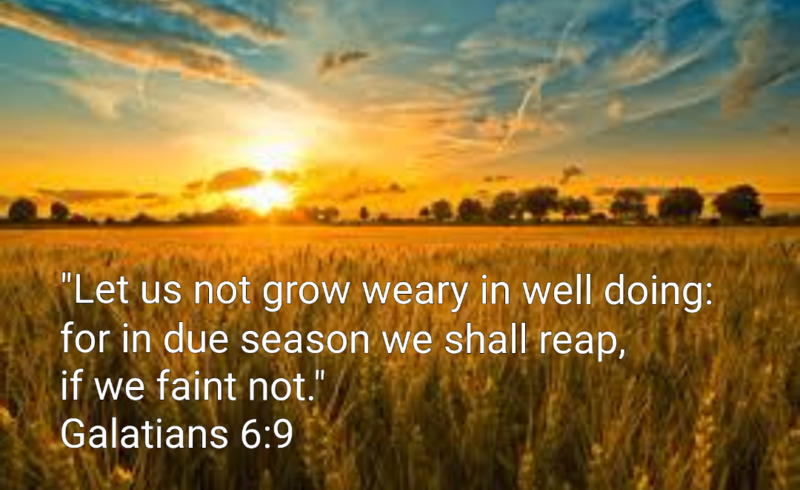 For in due time, if we faint not, we shall reap blessings! Never underestimate what a word of encouragement can do for another on this journey. I’ve got a fire burning again! Watch out world – my boots are laced!